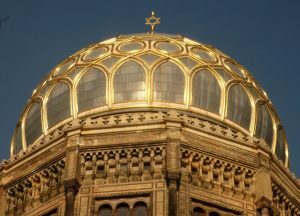 The Jewish history of Berlin is deeply intertwined with the overall history of the city, and all guides will include some Jewish history on their highlights tour. However, if you are interested in learning more about the specific Jewish history of Berlin, there is much more to see beyond just the main sites. While most people think of the Nazi regime when they think of the Jewish history, it is very important to remember that the Jewish community had existed in Berlin since the city’s founding in the 1200s, and grew considerably, first in the 1670s and then in the 1800s. With the emancipation of the Jews in the late 1800s, they enjoyed equal rights in Berlin, and their community flourished. Of course, this all came to a devastating halt with the arrival of Hitler and the Nazi party. There were a handful of Jews who survived WWII in Berlin, many in hiding, and stayed in the post-War period. With the fall of the Berlin Wall, the Jewish community is slowly growing again, largely due to the arrival of Russian Jews after the collapse of communism in the Soviet Union. Heidereutergasse – Site of the first synagogue built in Berlin, known as the Old Synagogue, dedicated in 1714, missed during Kristallnacht in 1938, and heavily damaged during WWII. Rosenstrasse – Site of the Jewish community center which was transformed into a detention center where Jews were collected and registered before being transported to the camps. The building became well-known after the Women’s Protest, when German women stood up to the Nazis to get their Jewish husbands released after their arrest, resulting in their survival during the War. Hackescher Markt and Hackescher Höfe – Part of the Barn Quarter, which became the Jewish neighborhood with the arrival of the Eastern European Jews in the 1800s. Then a poor part of town, now one of the trendiest areas in the city. Otto Weidt Workshop for the Blind – A small museum dedicated to the businessman Otto Weidt, a German who employed disabled Jewish workers in his wood workshop as a way to prevent them from being deported. While he was unsuccessful in saving many of his employees, he was able to rescue quite a few by putting them in hiding. Grosse-Hamburger-Strasse – A small street in the Barn Quarter home to the first Jewish cemetery (used from 1627 to 1872), the first Jewish retirement home, the Jewish Boys’ School, the Missing House Monument, and the Deserted Room Monument, as well as many Stumbling Stones. Adass Jisroel Synagogue – Established as an Orthodox synagogue in the 1869 in response to the greater Berlin Jewish community’s shift towards assimilation. Considered to be part of the creation of the branches of Judaism, as it is the first instance in which the word “Orthodox” was used. New Synagogue – Built in response to the increase of the Jewish population in Berlin in the 1860s, designed in the Moorish style, and saved by a local police officer during Kristallnacht in 1938. It is considered the first Reform synagogue in the world, and indeed resulted in the splitting of the Jewish community in Berlin. It was damaged during WWII, with the reconstruction planned by the East German government in 1988. With the subsequent fall of the Berlin Wall one year later, it was not re-opened until 1995, and is now a museum. Depending on time, some guides also like to take their clients to the very moving Track 17 Monument, which is in the far western part of the city and was the train track from where the Jewish victims of the Holocaust were transported by cattle cars to concentration and death camps in Eastern Europe. It is also possible to visit the Weissensee Cemetery, which is the largest active Jewish cemetery in Europe and was not touched by the Nazis. It was damaged during the bombing in WWII, and then located in former East Berlin and neglected for many decades. It is overgrown now, and is an incredible window into the lives of the Jews living in Berlin from 1888 to the present day.